Ivory/Latte/Mocha Watters Azriel Size 4 dress. 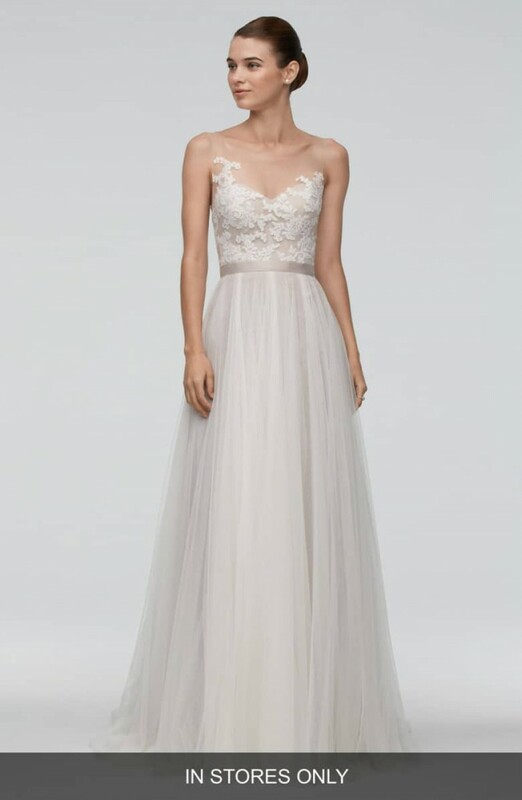 (+ free head veil - originally $250) Beautiful tulle material and illusion neck line. Professionally cleaned and kept in box immediately after wedding. Dress was taken in around the chest and waist and the train was shortened to make it a little less formal given the vintage feel of our wedding. Bra cups were sewed in (can be removed if needed) so that a bra would not need to be worn. I'm 5'4", 120 pounds, bra size 34B and wore ~3 inch heels.